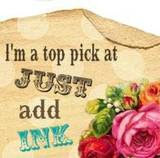 Many of you would have heard by now that Stampin' Up! are having a colour renovation. We have come to know and love the 4 colour families of Bold Brights, Rich Regals, Soft Subtles and Earth Elements plus neutrals but the time has come for an update and I for one love the changes. 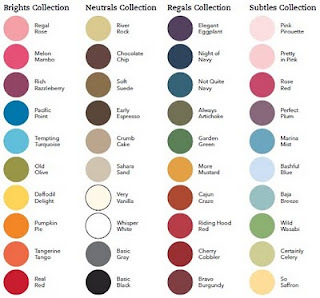 We will now have 4 colour collections: Brights, Subtles, Regals and Neutrals. Each collection has ten colours. The new colours are just gorgeous and my least used colour family (Bold Brights) will now be my go to collection. The sad news is that many colours will be disappearing when the new Idea Book and Catalogue is released in September. So if there are colours you cannot live without (Close to Cocoa comes to mind) or inkpads you haven't purchased refills for it would be wise to start thinking about that now so you can spread your purchases out over the next few months and before stocks run out. Stampin' Up! have really planned the change out well and customers who have purchased Marker, Crayon and Pastel sets will be able to purchase the new colours to update their sets. More details on these options will be available closer to the release of the new catalogue. PLUS we will still have In Colours and the new good news is that they will now be available for two years. Five colours will be released each year. So the first year we will have five and the second 10 and the third year the first lot will be retired and new group released so there will always be 10 In Colours available. All in all, definately a change for the better and I cannot wait to get my hands on the new core colours. If you have any questions about the Colour Renovation or would like to place an order please do not hesitate to contact me.